The knock-on effects of the meltdown in Chinese shares and the tension among major Middle East rivals are dominating the re-opening of the global capital markets after the New Year holiday. The US dollar has recouped its earlier losses against the euro, sterling and the Swiss franc, and remains broadly higher against the Antipodean currencies. The persistence of the yen's strength is the anomaly. Since Christmas, the dollar has consistently traded below the trend line connect the late-August and the mid-October lows (~JPY116.20 and JPY118 respectively). After flirting with support at JPY120, the dollar was convincingly pushed through there in Asia and has been unable to resurface it. It fell to JPY118.70 in Asia and retested it prior to the start of the North American session. Since the low was recorded, the greenback has not been above JPY119.40. There is another story that is important for investors but is at risk of being obscured by these other developments. 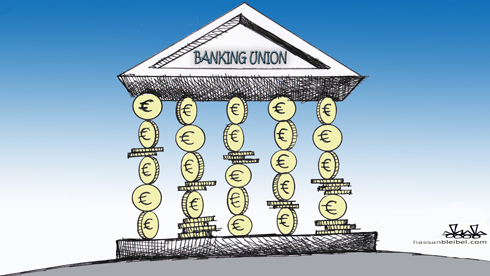 It is the two new pieces of EMU's banking union officially start today. As Portugal's selection of five of 52 senior bonds that are to be transferred to the "bad bank, which entails losses of about 2 bln euro. That all senior bond holders were not treated the same seems to violate the principal of pari passu, which requires all investors in a certain class (e.g. senior bond holders) are treated the same. It has spurred much concern among analysts, journalists and investors. Portugal argues that it is implementing a part of the banking union--Bank Resolution and Recovery Directive (BRRD). 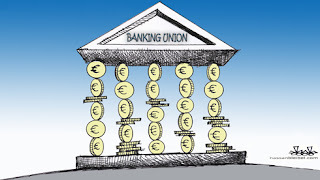 The purpose of the directive is to severe the link between banking crisis and sovereign crisis and to protect tax payers, after some 13% of GDP has reportedly been used since 2008 to support troubled banks. Equity investors and unsecured creditors, and subordinated bond holders have been fair game. The BRRD now formalizes the "bailing in" of senior bond holder and large depositors (excess of 100k euros). In some ways, this formalizes the procedure used in Cyprus. Taxpayers may still be called upon but only after the creditors incur losses of at least 8% of total liabilities. Some countries, notably Italy and Greece seemed to make some year-end moves to support some of their banks ahead of the BRRD coming in effect. Portugal is operating under the new directive. The Bank of Portugal's moves seem to have caught many off-guard. Some large institutional investors are involved and may seek legal recourse. Portugal sovereign bonds are under-performing today. While Italian and Spanish 10-year bond yields are off 5.5-6.5 bp today, the similar Portuguese yield is up about half a basis point. Portugal sovereign is a bit firmer today, but less than Spain and Italy. In addition to the BRRD, the other part of Europe's banking union that comes into effect today is the Single Resolution Mechanism. It is a eurozone-wide insolvency fund that will be funded by banks over the next eight years. The goal is to be able to wind up the failure of a large bank over a single weekend, working with national resolution authorities. A third piece of the banking union has been in place for a little more than a year. The ECB is the single supervisory for 129 banks deemed systemically important. While the seeming sacrifice of the pari passu principle is a cause of some consternation, the fourth part of the banking union, a common deposit insurance program is may be the most difficult for officials to reach agreement. Germany and other creditors are resisting on grounds that it is tantamount to a fiscal transfer. German taxpayers, so the argument goes, should not be liable for the depositors at a troubled Greek or Portuguese bank, for example.